How many times have you been on a jobsite only to find that your drain cleaning machines has clogged or is not working properly? 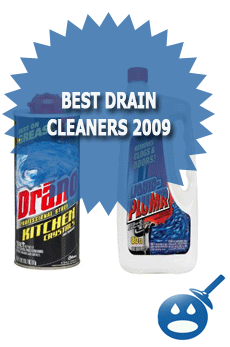 MyTana has a huge inventory of drain cleaning products that are made with high-grade materials. They offer everything from Cable Machines, Jetters and all of the necessary accessories. MyTana has been in business since 1957, they started out as a Roto-Rooter Franchise and soon branched out into a factory direct company providing the plumbing industry with all of the necessary tools to get the job done right. MyTana cable machines can be used for any application such as bathtubs, urinals and sinks for both commercial and residential uses. 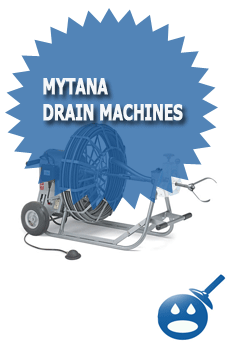 With MyTana Drain Cleaning Machines, you can choose your cable size and if you want to add some extras such as a Bucket Boss, Safety Glasses, All purpose Cleaners and Ugly Gloves MyTana has them all in stock. The company has 7 different Drain Cleaning Machines available, the M500, The Little Workhorse, The Septic Saver, The Big Workhorse, The Quiet Ride, The Upright Workhorse and the Big Main. All MyTana products all come with warranties against any defects that may be found in the materials and in the workmanship all for the first year from the date of the purchase. 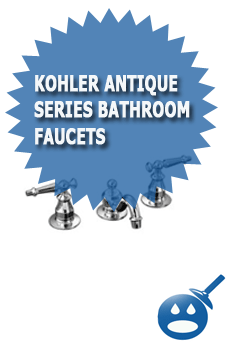 The company is dedicated to provide the plumbing professional with quality, dependable and long lasting products. Take a look at the 7 different Drain Cleaners that MyTana has to offer. 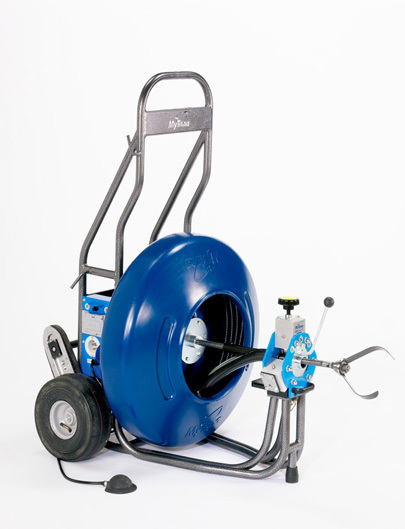 The M500 is a sinkline cable machine that was designed for cleaning 1″ and 2″ drain lines. The best applications of the M500 are for bathtubs, urinals and sinks. Some of the specifications of the M500 are that it uses a 1/3 horsepower motor. It is a belt driven motor and it comes with a 1/4″ cable but it can also be used in conjunction with a 5/16″ cable. The M500 features a watertight electrical box and an air actuated foot pedal and hose. 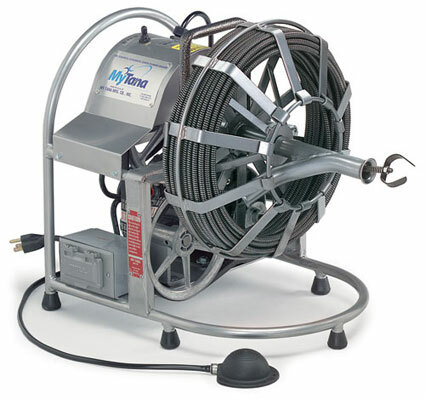 This Cable Machine from MyTana comes with an elephant trunk and a foot pedal and hose for easy drain cleaning. Plus the machine comes with a set of work gloves for safety and cleanliness. This machine comes with its own bottle of MT21. Everything you need and more. Now you can own this machine and save yourself a ton of money on costly service calls. The M500 is reasonably priced at $699.00 to start. The Little Workhorse or Model M661 is a sinkline cable machine that was designed and created for 1-1/4″ to 3″ drain lines. This cable machine comes with a 1/3 horsepower motor and a belt drive. Some of the added features of the Little Workhorse are that it comes with a foot pedal, a built in GFCI circuit and a watertight electrical switch and box. In addition to these great features the Little Workhorse is equipped with a reversing switch, making retraction 100% easier than on other manual machines. 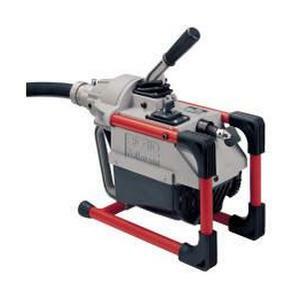 The cable machine works with 1/4″ 3/8″ and 1/2″ drain lines. If you are using a 1/2″ cable you will get a small hoop and an elephant trunk. Since blades are not necessary, you won’t find any. If you are ordering this machine with a 3/8″ cable, you will find single blades in 1-1/2 and 2 inches. You will also receive a flexible grease spring, a drop head on swivel and male ends. If you are ordering this machine with 1/2″ cable, you will get blades in 2″, 2-1/8″, 3″ and 4″. You will also get threaded mounting blocks and male ends. With all cable machines, you will get a foot pedal and hose; a pair of gloves, a quart of MT21, a 5/32″ tee handles hex key tool and a reel cover if you chose an open steel reel. How can you ask for more? Even the price is well worth it, The M661 starts at $ 764.00 plus any options that you may want to add. 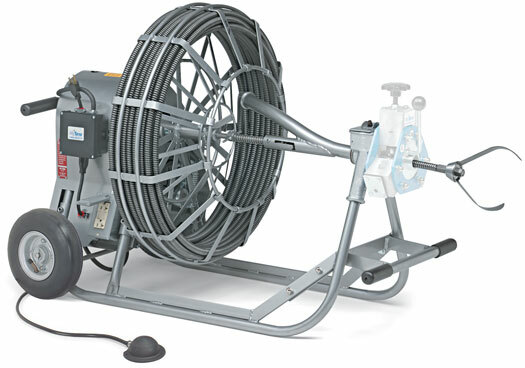 Another great cable machine is the Septic Saver, this style of cable machine works perfectly with 3 and4″ cable lines. The specifications of the Septic Saver are the belt driven motor and the 1/3 horsepower motor. The machine comes with a 9/16″ standard cable but it will also work perfectly with 3/8″, 1/2″ and 5/8″ cable.The Septic Saver or Model M755 offers 8″ pneumatic tires, a standard foot pedal, a stair climber, a loading wheel and a built in GFCI circuit. Some special features of the cable machine are the telescoping removable handle and the reversing switch making this machine easy to manage. The machine comes with a watertight electrical switch and box. With the Septic Saver, you will get a 3-foot flexible leader cable, blades in sizes, 2″, 2-1/8″, 3″ and 4″. You will get a Pig Tail Retriever, a leader cable, threaded mounting blocks and a reel cover. MyTana will include a pair of gloves, a foot pedal and hose and 5/32″ tee handle hex key tool. The Septic Saver starts at $1,239.00 and worth every penny. 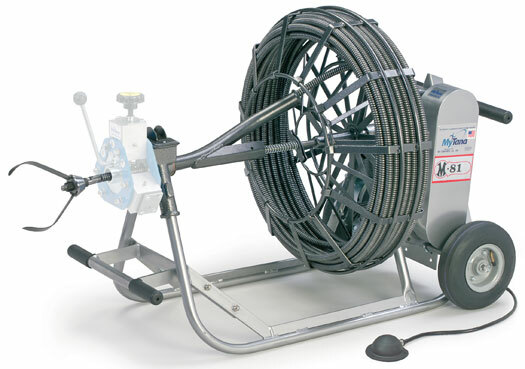 The Big Workhorse or Model M81 is a mainline cable machine that works well with the cleaning of plumbing drain lines between 3″ and 10″; this is more of a commercial machine. This machine is more powerful than the others, it has a 1/2 horsepower motor and your choice of 11/16″ or 3/4″ cables. You will also find a gearbox power handles that work with 300 to 400 feet of cable. This cable machine works with 3/8″, 9/16″ and 5/8″ cables. Some of the features you will find on the Big Workhorse cable machine are 8″ pneumatic tires, a foot pedal, a watertight electrical switch and boxed making this cable machine perfectly safe to use in water. The model M81 comes with a reverse switch and a spring-loaded J lock-revolving arm. The Big Workhorse comes with 3 feet of flexible leader cable, single and double blades, splicing cores, slip joint ends and 5/32″ tee handle hex key tool. You will also receive a foot pedal and hose, a pair of gloves and a quart of MT21. The cost of the Big Workhorse starts at $1889.00. 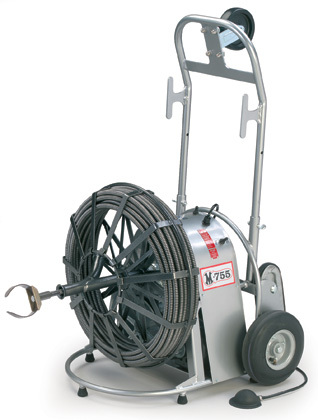 The Quiet Ride or Model M844 is also a mainline cable machine used for cleaning out drain lines between 3 and 10 inches. There is an optional auto feed available for easier handling of the machine. On the Quite Ride you will get 1/2 horsepower motor and a belt driven motor. You can choose from 11/16″ or 3/4″ cables, but the machine an work with 3/8″, 1/2″, 9/16″ and 5/8″ cables. The Quiet Ride from MyTana offers 8″ pneumatic tires, a standard foot pedal, a spring loaded J Lock revolving arm and a built in GFCI circuit. You will also find a reverse switch for easy retraction and a standard watertight electrical switch and box. Included with the Quiet Ride you will find 3 feet of leader cable, single, narrow and double blades. The unit comes with couplings, splicing cores, threaded mounting blocks and reel cover. You will also receive a quart bottle of MT21, a pair of safety gloves and a foot pedal and hose. The price of the Quiet Ride starts at $1,689.00. 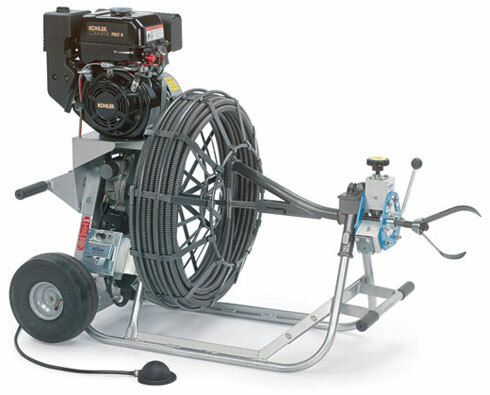 The Upright Workhorse is an upright version of the Big Workhorse; it is a mainliner cable machine that is used for cleaning drain lines between 3″ and 10″. There is an automatic feed line and retriever as a standard on this machine. This cable machine comes with 1/2 horsepower motor. The unit has a gearbox power handle that works with 300-400 feet cable. On closed reel machines you can choose between 11/16″ and 3/4″ cables. The Upright Workhorse or the M888 comes with 10″ pneumatic tires, an air actuated foot pedal and hose. This machine comes with a built in GFCI circuit and stain climbers. The M888 comes with a removable pneumatic loading wheel. You will never have to struggle with a cable machine ever again with the Upright Workhorse. Unlike the other machines we mentioned, the Big Main is a gas powered standard cable machine. 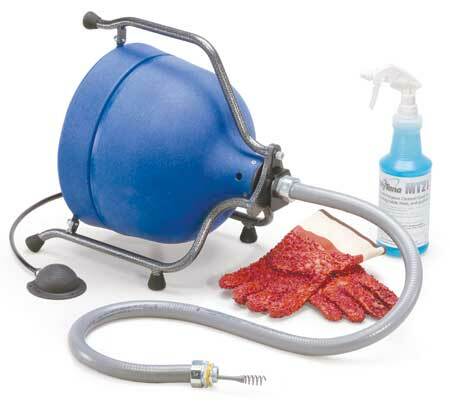 This machine was designed to clean out 3″ to 10″ drain lines. The company offers an optional dual gas/electric motor as well. You will find on the Big Main a 4 horsepower Kohler motor (this motor is more powerful than the other models we featured). You will find a gearbox that can handle between 300 and 400 feet of cable. The unit comes with a 3/4″ cable but the Big Main can also work with 1/2″, 9/16″, 5/8″ and 11/16″ cables. The Big Main comes with an automatic feed and retriever, 10 ” pneumatic tires and a water tight gear box. You will also find a built in GFCI Circuit, a spring-loaded J lock-revolving arm. Included with the Big Main you will find a Manhole Cable Guide, a Pig Tail Receiver, Single and Narrow Blades and a reel cover. You will also get a pair of gloves, foot pedal and hose and a quart of MT21. The Big Main is a great product and worth every penny of the $2,489.00 as a starting price. With so many different drain cleaners out there, the 7 that we profiled are some of the best in the business. They are powerful machines and they are dependable and will get the job done. They are easy to use and easy to maintain. If you are in the market for a drain cleaner, look no further than the Big Main, Little Workhorse and the Quiet Ride. With these machines, drain clogs will never be a headache again. Would also be interested in an additional 100′ roll.